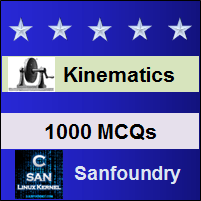 This set of Machine Kinematics Multiple Choice Questions & Answers (MCQs) focuses on “Number of Degrees of Freedom for Plane Mechanisms”. Explanation: The number of pairs of links or the number of instantaneous centres is the number of combinations of n links taken two at a time. Mathematically, number of instantaneous centres, n(n-1)/2. they have three instantaneous centres and lie on a straight line. 3. Which of the following property of the instantaneous center is correct? a) A rigid link rotates instantaneously relative to another link at the instantaneous centre for the configuration of the mechanism considered. b) The two rigid links have no linear velocity relative to each other at the instantaneous centre. c) The velocity of the instantaneous centre relative to any third link is same whether the instantaneous centre is regarded as a point on the first link or on the second rigid link. a) directly proportional to the distance from the points to the instantaneous centre and is parallel to the line joining the point to the instantaneous centre. b) directly proportional to the distance from the points to the instantaneous centre and is perpendicular to the line joining the point to the instantaneous centre. c) inversely proportional to the distance from the points to the instantaneous centre and is parallel to the line joining the point to the instantaneous centre. d) inversely proportional to the distance from the points to the instantaneous centre and is perpendicular to the line joining the point to the instantaneous centre. Explanation: Fixed instantaneous centres remain in the same place for all configurations of the mechanism. 6. The instantaneous centres, which moves as the mechanism moves but joints are of permanent nature, are called permanent instantaneous centres. Explanation: The permanent instantaneous centres move when the mechanism moves, but the joints are of permanent nature. Fixed instantaneous centres remain in the same place for all configurations of the mechanism. Explanation: Neither fixed nor permanent instantaneous centres vary with the configuration of the mechanism. 9. The two links are said to have a pure rolling contact, when their instantaneous centre __________ on their point of contact. 10. When a slider moves on a fixed link having ____________ their instantaneous center lies at infinity. Explanation: When a slider moves on a fixed link having curved surface, their instantaneous centre lies at the centre of curvature. When a slider moves on a fixed link having straight surface their instantaneous center lies at infinity. 12. A slider moving on a fixed link having constant radius of curvature will have its instantaneous centre at the center of the circle.